House Prices fell .5% month over month, the third consecutive monthly decline according to Case-Shiller. On a year-over-year basis, they are still up 6.75%. Consumer confidence dropped markedly in in September, according to the Conference Board. It fell from an upward-revised 93.4 to 86. The present situation index fell from 93.9 to 89.4 and the Expectations index fell from 93.1 to 83.7. The ISM Milwaukee Index came in at 63.18, better than the street expectations of 61. The Chicago Purchasing Manager Index came in at 60.5, below expectations as well. Dallas Fed President Richard Fisher would raise rates in the Spring of next year instead of waiting until the summer. Regardless, it is looking like the first rate hike will be at the June 2015 FOMC meeting, provided things continue on the same economic course. Note that the Fed Funds Futures are predicting the Fed will be less aggressive than advertised in the dot graphs. Note that inflationary pressures are moderating courtesy of a bear market in commodities, driven by a stronger dollar and slower Chinese growth. The PCE Price Index (the preferred inflation measure for the Fed) rose by only 1.5% last month, which is well below the Fed’s target. Speaking of commodities, the US is set to become the world’s largest producer of liquid petroleum, passing Saudi Arabia for the first time since 1991. Cheap energy is going to be the basis for the next big boom in the US as manufacturing relocates back to the U.S.
A new paper from Brookings says the Fed and the Treasury should coordinate policies more. 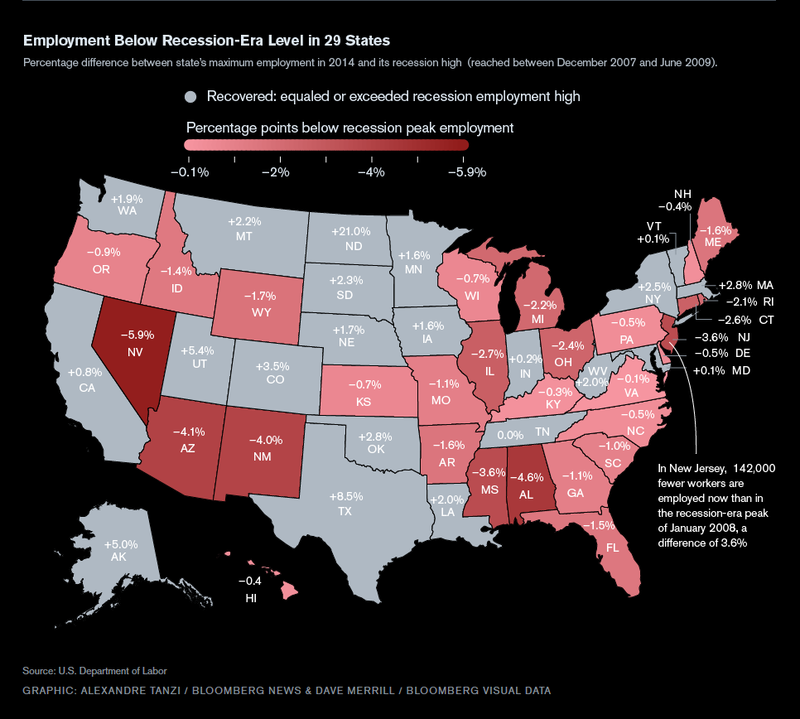 Employment has crawled back to peak levels in parts of the country, but 29 out of 50 states are still below that level. The states hit the hardest in the real estate bust – Nevada, Arizona, and Florida – are furthest from peak levels. Stocks are lower this morning on the demonstrations in Hong Kong. Bonds and MBS are up. This is a big week data-wise. We will get the ISM report, construction spending, Case-Shiller, and then the jobs report on Friday. Given that bonds again seem to be driven by overseas events, I think the jobs report will probably be a non-event for the bond market unless it is exceptionally strong or exceptionally weak. Pending Home Sales fell 1% in August after rising 3.2% in July. The West was up 2.6%, while the rest of the US was down. Bill Gross is out at PIMCO and has joined Janus Capital. This follows record outflows at the flagship Total Return Fund, which Gross ran. PIMCO anticipates another $10 billion will leave on the news. Personal Incomes rose .3% in August, while Personal spending rose .5%. The PCE Core rate (the inflation measure the Fed prefers to use) rose 1.5% year-over-year, below their 2% target rate. Freddie Mac’s Chief Economist told the New England Mortgage Banking Conference that 2015 could be the best year for home sales since 2007. They are forecasting mortgage rates to be around 5% by the end of 2015. Markets are lower this morning on no real news. Bonds and MBS are up. Initial Jobless Claims came in below 300k again, which is a number associated with booming economic times. People that have jobs aren’t losing them, however the long term unemployed continue to sit on the sidelines. Durable Goods orders fell 18.2% in August after rising 22.5% in July. They normally aren’t that volatile. Transportation orders tend to be lumpy and that explains the huge jumps. Ex-transportation, they rose .7%. 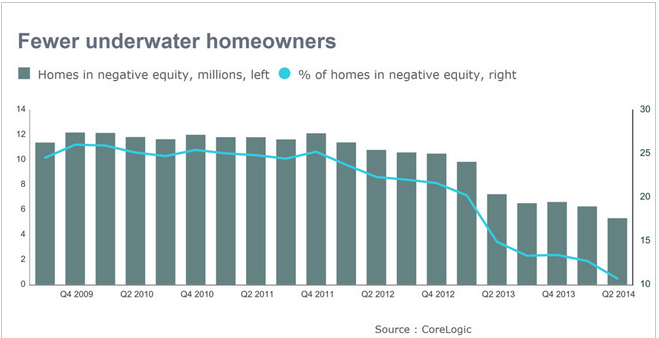 Almost a million homes regained positive equity in the second quarter, according to Corelogic. The share of mortgaged homes with negative equity fell to 10.7% compared to 12.7% in the first quarter and 14.9% last year. Negative equity percent peaked around 25% in 2009. This should help increase existing home sales and home supply as more and more people become able to move, which should be an incremental positive for the mortgage banking business. Fair lending laws might be getting a review at the Supreme Court level. For decades, bankers could be found guilty of discrimination even if they did not intend to discriminate. Lending patterns could be enough to prove discrimination. Now, this could be headed to the Supreme Court after Texas officials ruled the disparate impact standard is too loose. The Roberts Court overturned provisions of the Voting Rights Act, and advocates on both sides suspect that the majority will rule for the narrower standard. If that happens, then life could get a lot easier for mortgage bankers, who are caught between the QM and the fair lending laws. Markets are higher this morning as Europe rallies. Bonds and MBS are down small. Mortgage Applications fell 4.1% last week. Purchases dropped .3% while refis fell 7%. After ignoring the rally in bonds all summer, mortgage rates are increasing as bond yields increase. It seemed like the 30 year fixed rate mortgage was stuck at 4.25%, even as the 10 year yield approached 2.3%. Now that rates are increasing, mortgage rates are increasing in lockstep. Note that MBA has the average 30 year fixed rate mortgage at 4.39%, while Bankrate has it at 4.18%. 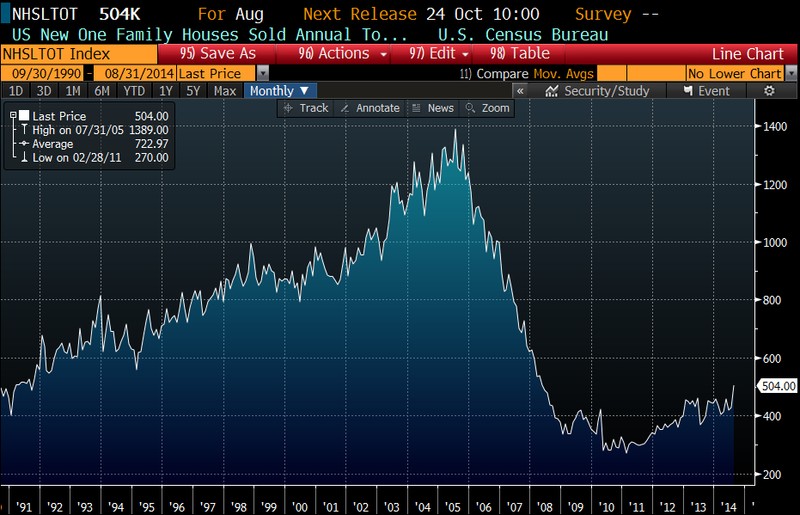 New Home Sales increased to 504k, the highest level since May of 2008. That said, half a million is still well below “normalcy” of 800k or so, or even the peak in 2005 at 1.4 million. Again, further evidence of just how much housing has been absent from this recovery, and also how much pent-up demand we have. Homebuilder KB Home missed earnings expectations in a big way, with eps coming in at $0.28 vs expectations of $0.41 and revenues of $589 million vs expectations of $646 million. Revenues increased 7% driven by a 9% increase in ASPs and 2% drop in orders. ASPs were up 21% (!) on the West Coast. KB’s mortgage banking JV with Nationstar began during the quarter. Gross margins continue to improve. The company noted an “appreciable uptick” in traffic levels which they saw as “strong evidence of the pent-up demand for new housing.” The stock is down about a buck and a half pre-open. Soon after Jack Lew and Obama released their new plans on corporate inversions and declared companies that pursue such strategies “unpatriotic,” that old triangulator Bill Clinton refused to go there and instead talked about tax inversion. I guess Bill will be floating all of Hill’s trial balloons, and acting as Obama’s back-seat driver for the rest his term. Obama’s gotta love that. FWIW, the Street doesn’t seem to be taking this too seriously – Burger King (which is in the process of buying Tim Horton) said that it will continue to with its merger regardless, as did Medtronic. The COV / MDT spread didn’t even move. The biggest foreign buyer of U.S. real estate is Canada, but who do you think is #2? Hint: It isn’t China. It is Norway. For those that don’t know, Norway (which has a population smaller than NYC) has a real estate bubble that has defied gravity for years. Foreign purchases of US real estate assets tends to accompany bubbles in their home countries, and China, Canada, and Norway all are in the midst of real estate bubbles. While this probably affects commercial more than resi, I could see some pressure at the high end as these bubbles burst. Lending to minorities is at a 14 year low. I guess buyback risk has gotten everyone so spooked, they aren’t interested in doing FHA and low income lending, except as needed to keep their fair lending numbers in the acceptable range. Anyway, lenders should expect some sort of response from the Administration, and fair lending enforcement is probably going to be stepped up. Markets are down on no real news. Bonds and MBS are up. Home Prices increased .1% on a seasonally adjusted basis in July, according to the FHFA. 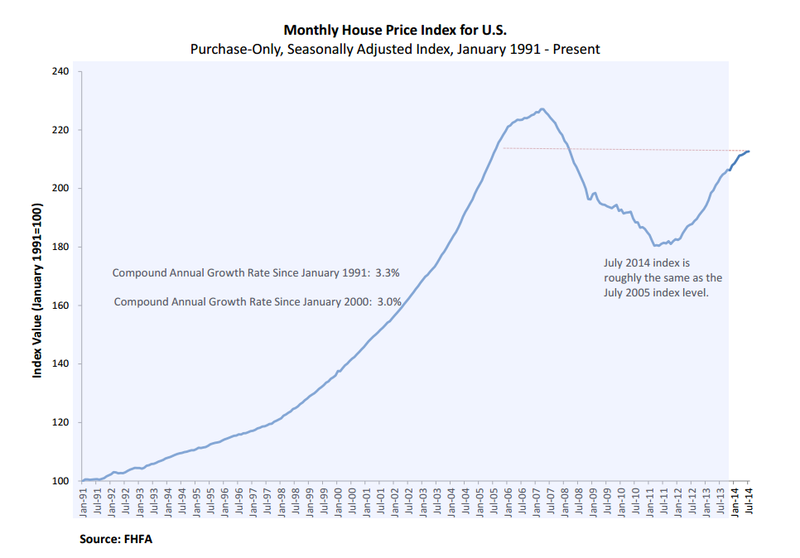 On a year-over-year basis, prices are up 4.4% and the index is 6.4% below its April 2007 peak. I wanted to mention something from yesterday’s existing home sales report. All cash sales have dropped to 23% of all purchases, down from nearly 29% a month ago. It seems like professional investors are not chasing properties at these levels, which is opening the door for more traditional homebuyers. In terms of how this affects mortgage bankers, consider this – as cash percentages drop, that means the number of sales with a mortgage is increasing. So even though existing home sales fell from 5.14 million to 5.05 million from July to August, the number of homes with a mortgage (in other words, gettable business) actually increased about 6.5%. The White House has taken action on corporate inversions, not by banning them, but by trying to make them less financially attractive. The rules are not finalized, so it is too early to say whether the Administration’s plans are even legal. Corporate tax reform is needed, and the left will have to trade lower rates for closing loopholes. This is an attempt to steal a freebie. Also, the administration is hoping that by bringing that point up, Republicans can be branded as “pro-corporate deserters.” Corporate Inversion arb spreads are wider this morning. Goldman is calling for a 4% 10 year bond yield within the next year as QE ends and the Fed starts hiking rates. Lately, the correlation between Treasuries and mortgages has broken down, so it is unclear how much mortgage rates will rise as a result. Citi is out with a note discussing what happens to corporate bond yields when rates start increasing. Historically, rate increases have been a benign event, however we are in uncharted waters here, and Citi is advising caution. Note that the Fed is about to get significantly more dovish as two hawks – Philly Fed President Charles Plosser and Richard Fisher, Dallas Fed President retire. They weren’t going to be voting members next year at any rate, however the Fed is losing some important hawkish voices. The Fed could now be running the risk of groupthink. Markets are higher this morning on no real news. Bonds and MBS are up. Merger Monday continues apace, with a few big deals – Merck Kga is buying chemical giant Sigma-Aldrich, and Siemens agreed to buy Dresser-Rand. Existing Home Sales came in at 5.05 million units, according to NAR. This is a 5.3% drop year-over-year. The median house price increased to $219,800 which is up 4.8%. All cash sales dropped to 23% of all transactions in August and represents the lowest share since December 2009. So, there is at least some good news for mortgage bankers. It looks like investors are stepping away from the market, which should pave the way for the first time homebuyer, who has been shut out due to bidding wars and the advantages of a cash buyer. The Alibaba IPO went swimmingly, with $25 billion worth of stock being sold and the stock trading up 38% on the first day. The company now sports a valuation of $231 billion, which puts it in the same territory as JP Morgan and Chevron. Note that Chevron throws off about 10 times the EBITDA that BABA does. The Chicago Fed National Activity Index slipped in August to -.21, We saw from the industrial production data that the auto sector had a huge July followed by a weak August. Kansas’ state unemployment rate came in at 4.9%, well below the national average. For those who haven’t been following closely, Kansas has been quite the ideological football lately. The left has been assiduously trying to paint Kansas’s tax cut package as a dismal failure. Of course the idea was to attract companies to relocate to Kansas and that won’t happen overnight. Needless to say, there is an election coming up, and control of the Senate may hinge on Kansas. We all know the housing sector continues to punch below its weight. One reason is student loan debt, which has the effect of depressing home sales by 8%, according to a new paper. That equates to about $83 billion in lost activity. We have discussed before the misconceptions regarding how to qualify for a mortgage. Separately, FHA loans fell 19% compared to a year ago as bankers pull away following an avalanche of lawsuits and buybacks. In fact, JP Morgan CEO Jamie Dimon said on his second quarter earnings conference call that the bank is wondering whether to be in the FHA business at all. Housing advocates are pushing for more low-income lending and are vexed that the banks are making less loans. now.